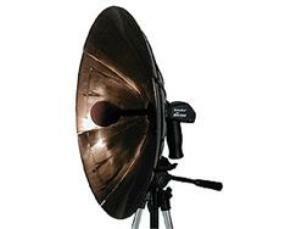 20-inch diameter snap-together parabolic dish combined with the most advanced audio circuitry available. input jack for outstanding surveillance capabilities. The DetectEar can be mounted to a tripod for extended use and comes with a hard carrying case for discreet and easy transportation. Powered by only 2AAA batteries, the DetectEar is your ultimate professional listening device. Connects the DetectEarto your tape recorder or video camera. Available at your local electronics store.